Another great web dev tools « What did I learn today ? What did I learn today ? UPDATE: Damm it this site has been down for a couple of days so I am going to have to find another good phone and ipad emulator as soon as I do I will be updating this post . I am loving the http://transmog.net/ emulator tool. It actually renders mobile webpages more accurately than any other web-based simulator. It simulates a touchscreen interface and sends requests with your chosen user agent eg iphone 4, iphone 5, samsung galaxy etc- ok it doesn’t have the latest devices you web devs probably do and its actually old devices you need to test in. Its quick without a ton of advertising and closest scams- I know everyone has to make money but some sites just take it way too far. 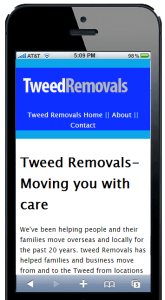 When I was testing the visual rendering of my example responsive tweed removals website it was a life saver. This entry was posted on Tuesday, October 13th, 2015 at 6:20 am	and is filed under Web Development. You can follow any responses to this entry through the RSS 2.0 feed. Both comments and pings are currently closed.